Working with a drywall is not a DIY task even for experienced DIYers. This is why it’s highly recommended that you hire a drywall contractor. If you’re currently looking for one, your search stops now since we here at Indigo Construction have everything that you need for your project. Some contractors specialize in smaller projects. These are usually the contractors that are just starting out in the industry. On the other hand, some contractors focus on larger projects. You don’t have to worry even if your project is large or small. Our trained personnel can handle projects of any size. No project is too small. We understand that someone has to take care of the minor repairs and ensure that they’re repaired safely and effectively. No project is too large. We have the personnel, skills and experience to tackle the challenges of large projects. Simply put, we can help you with your sheetrock project no matter how small or large it is. You just need to contact us. This is one of the simplest tasks when it comes to repair-work, but it still requires the expertise of a trained contractor if you want the best result. We’ll send people who’re trained for patching and repairing tasks. They can work with any texture. Speaking of textures, we can help you achieve the texture that you want to decorate your gypsum wallboard. If you’re remodeling, someone needs to take make your walls look perfect and we’re the right company for it. A lot of our projects are from homeowners who’re remodeling so we’re experienced in this. If your home was a recent victim to a fire, even if it’s just a small one, there’s a good chance that there’s smoke and fire damage. We’re the company to trust when it comes to the restoration of your sheetrock if this is the case. More and more homeowners are going for a level 4 or even level 5 smooth finish. Jump in on the trend with our help. We have the best finishers in the industry. It’s time to get started. 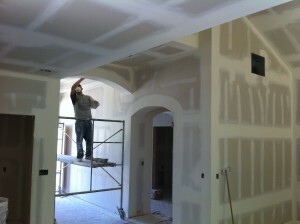 Contact us today so we can provide you with an estimate for your drywall project! 04/08/2019 The estimator for our project adding insulation to a top-floor condo unit was excellent. He took pictures to take back to the company to emphasize that this was a 4th floor unit and would require extra-long hoses to reach the unit. Still, when the workmen appeared they thought they were doing a "house" and did not have the equipment necessary. After having taken my time to meet with them they needed to return on a different day. Very inconvenient. Work was OK when finally finished. 04/04/2019 Contacted Indigo to patch up a large section of a wall in our house that had been cut out for some work. They were easy to get in touch with (very communicative and available! ), provided a reasonable quote, and got us scheduled within a week to get the work done. On the agreed upon day, their team showed up RIGHT on time, were friendly and courteous, finished the job promptly, packed up their gear and cleaned up after themselves. This is the kind of business you want working on your home!! 03/27/2019 Comprehensive bid, good communication, professional, courteous, beautiful results! 03/27/2019 Worker arrived on time and had job all done by lunchtime. He cleaned up afterwards and I would hire him again. Ceiling texture matched very well and the wall patches were invisible.